New Factsheet on Women's Economic, Social and Cultural Rights and Guide: Claiming Women's ESC Rights Using OP-CEDAW and OP-ICESCR, published by Women and ESCR Working Group. ESCR-Net’s System of Solidarity and Support (SOS) advanced via the launch of a secure website to enable human rights defenders to safely request urgent assistance, facilitate Members initiating solidarity actions, and provide resources for human rights defenders. How do we make economic, social and cultural rights a reality in Latin America? – Regional meeting to advance implementation of positive decisions held in Colombia. The NGO Coalition and renewed Group of Friends of the OP-ICESCR celebrated the imminent entry into force of the Optional Protocol to the International Covenant on Economic, Social and Cultural Rights with a parallel event during the 22nd Human Rights Council Session. 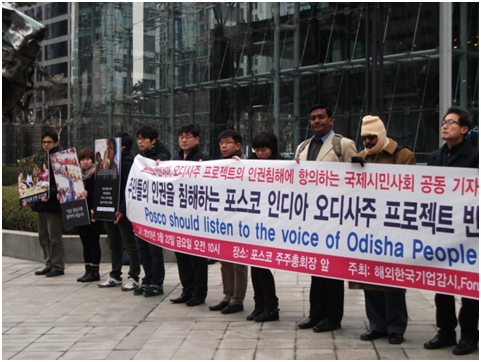 Members and allies involved in our ‘STOP POSCO Campaign’ undertook a series of actions in March, lobbying for the POSCO Corporation, investors and the governments of India and South Korea to stop forcibly evicting 20,000 villagers in Odisha, India. 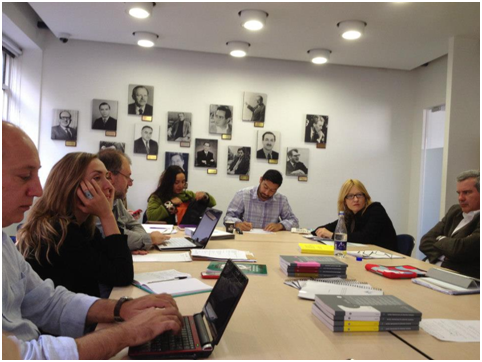 Transitions at the ESCR-Net Secretariat and Meeting of the ESCR-Net Board.